EJ Magazine: Where did the initial idea for Farm Together Now come from? Daniel Tucker: “One thing we talked a lot about when we started the project was that there was an incredible array of food-related literature out in the world that was describing the problems of the food system and creating an analysis. We felt like our contribution could be more. Even if there are occasional articles or spots in a documentary that highlight different sustainable farming practices, there wasn’t really a documentary project that profiled a wide range of people and gave a sense of the diversity and complexity that make up this emerging social movement around food. We’re not experts, we’re not people who can necessarily provide you with the best analysis of what’s wrong with the food system. 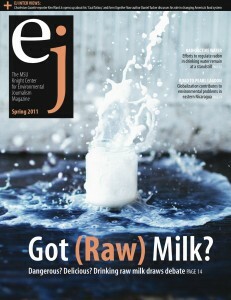 EJ: Previous work you’ve done hasn’t been directly tied to the food movement, so why write about food? DT: ….So, for me, the question is really about what are the most exciting and inspiring, challenging, hopeful social movements that exist in this country right now. EJ: Are there any places you had wished you had visited, but didn’t? DT: “We did the best we could with our limited resources, but there are so many places not in the book that it’s hard to pin down. But definitely one place I was curious to go to was Miami. My understanding is a lot of the urban agriculture work happening there is closely connected with activism around fighting evictions. People are making an interesting link between affordable housing and using open space for food production that I think is an unusual mix. A group called Take Back the Land is basically taking back houses that people had been evicted from and putting [those people back] in houses. Then, [Take Back the Land] said if we’re doing stuff around urban land use, then we should also be talking about other things people need, which includes food. And so, they started squatting, taking over empty land and growing their own food. That seemed really exciting to me and I’m sad that we didn’t get to go down there, but their work, in terms of food production, was just starting to take off when we started working on the book……..
EJ: Why did you decide to use the interview format? EJ: What was the editing process like?